These outstanding limited edition First Day Covers commemorate J.R.R. Tolkien’s timeless Middle-Earth with inspiring moments and principal characters from Peter Jackson’s award-winning ‘The Lord of The Rings’ movies. Each pays tribute to ‘The Lord of The Rings’ trilogy and explore Tolkien’s classic saga in a manner that movie enthusiasts, stamp lovers, and fans will enjoy and appreciate. Released in December 2001, these six Fellowship First Day Covers are affixed with Miniature Sheet stamps showing pivotal scenes from award winning ‘Fellowship of the Ring’ movie, each with first day (Dec 04, 2001) cancellation postmark. Each First Day Cover (FDC) envelope features Elven warriors at the Great Battle on Dagorlad Plain and measures 4.72 H x 8.07 W inches; 120 x 205 mm. Issue date: 4 December 2001 (12/4/01). Set features - 40 cent: Gandalf (Ian McKellen) and Saruman (Christopher Lee) in Isengard, 80 cent: Galadriel (Cate Blanchett) of Lorien, 90 cent: Frodo (Elijah Woods), Sam (Sean Astin) and Peregrin (Billy Boyd), $1.30: Frodo at Rivendell, $1.50: Mysterious Strider (Viggo Mortensen) aka Aragorn, $2.00: Boromir (Sean Bean) sounds alarm. Second release of First Day Covers were similarly affixed with Miniature Sheet stamps showing pivotal scenes from award winning ‘Two Towers’ motion picture, each with first day (Dec 04, 2002) cancellation postmark. These six First Day Cover (FDC) envelopes feature Lady Éowyn on the steps of Meduseld in Edoras and measure 4.72 H x 8.07 W inches; 120 x 205 mm. Issue date: 4 December 2002 (12/4/02). Set features - 40 cent: Aragorn (Viggo Mortensen) and Lady Éowyn (Miranda Otto), 80 cent: Orc raider riding Warg, 90 cent: Gandalf (Sir Ian McKellen) thought dead till he reappears in Fangorn Forest, $1.30: Haradrim soldiers also known as ‘Easterlings’, $1.50: Frodo (Elijah Woods) and Sam captured by Faramir’s men, $2.00: Éowyn on the steps of Meduseld. Third and final issue of First Day Covers were affixed with Miniature Sheet stamps showing key characters and scenes from much awaited ‘Return of the King’ movie, each with first day (Nov 5, 2003) cancellation postmark. Each First Day Cover (FDC) envelope measures 4.72 H x 8.07 W inches; 120 x 205 mm. Issue date: 5 November 2003 (11/5/03). Set features - 40 cent: Legolas (Orlando Bloom) and Gimli (John Rhys-Davies), 80 cent: Frodo Baggins (Elijah Woods) enters spider’s den, 90 cent: Hobbits Merry (Dominic Monaghan) and Pippin (Billy Boyd) must remain strong at heart, $1.30: Aragorn (Viggo Mortensen) warrior King, $1.50: Gandalf (Sir Ian McKellen) the White - warrior wizard, $2.00: Gollum (Andy Serkis) on the trail of “my precious”. Sets of two Standard first day covers each affixed with six gummed or self-adhesive stamps are also available for each issue. First day envelopes and stamps for Fellowship of the Ring and Two Towers were designed by Sacha Lees at Peter Jackson’s Weta Workshop - one of the same team nominated for three Academy Awards and winner of two prestigious BAFTA Awards; Return of the King were designed by Frans Lenzen. 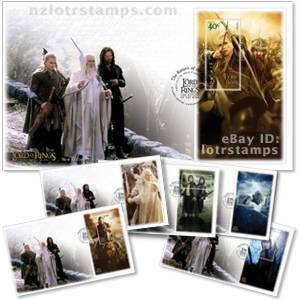 Each set comes in a clear, archival quality protective sleeve, and includes a bonus collectible Lord of the Rings official stamps brochure containing background information on these stamp releases and epic movies they honour. Officially licensed by New Line Productions these first day covers sold out faster than anticipated; stock of some items is extremely limited.